Summer Quince Coral tapestry shows a work inspired by William Morris' Summer Quince. Here we see a work of beauty of design and balance of color. The Summer Quince tree is seen with acanthus leaves as decoration in glorious coral reds, and the quince tree is in full bloom with its white flowers. A forest scene is seen to decorate the background. The work of Morris and Co in the 19th century represented the evolution of home decor to that of unique and individual beauty and the elements of nature were used, such as in this work, to provide beauty for the home. 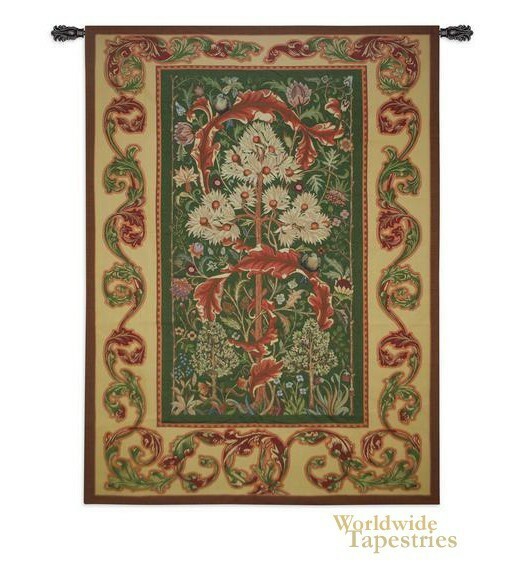 Summer Quince Coral tapestry is backed with lining and tunnel for easy hanging. Note: tapestry rod, where pictured, are not included in the price. Dimensions: W 60" x H 82"